Michael E. Lamb was elected Controller of the City of Pittsburgh in November of 2007, and took office on January 7, 2008. As Controller, Michael Lamb has put a focus on making the Pittsburgh government more transparent. Lamb created Open Book Pittsburgh, a website that allows citizens to search and view all City contracts, and campaign contributions and expenses of all candidates running for office in the City of Pittsburgh. Lamb also released Pittsburgh’s first Popular Annual Financial Report (PAFR), a user-friendly version of the City’s Comprehensive Annual Financial Report (CAFR) that provides a clearer picture of the state of Pittsburgh’s finances and information on Pittsburgh’s demographics and government. Michael Lamb has worked to make the Controller’s Office more effective and the City more efficient. Audits by the City Controller’s Office under Lamb have exposed waste and abuse of taxpayer dollars in many City departments and authorities. Audits also led to improvements by City departments and authorities in the way they interact with taxpayers. Working with officials from neighboring municipalities, Michael was instrumental in the creation of CONNECT, The Congress of Neighboring Communities. An aggressive political organizer, Michael Lamb has managed successful political campaigns in Allegheny County and in the City of Pittsburgh, including the Allegheny 2000 Citizens Committee which advocated for the County Home Rule Charter. 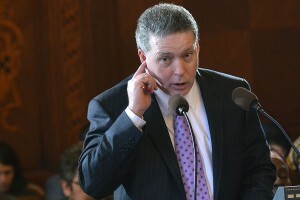 Putting the interests of Allegheny County’s citizens before his own, Lamb was an outspoken supporter of row office consolidation, even advocating for the elimination of the Prothonotary’s Office, his own elected position. In 2005, the citizens of Allegheny County voted to consolidate the County’s row offices. As a result, Lamb became the last Prothonotary of Allegheny County. In addition to being City Controller, Michael Lamb is active in the community. Lamb serves on the boards of the Kane Foundation, the Catholic Youth Association, the Downtown Pittsburgh YMCA and the 3 Rivers Wet Weather Demonstration Project. He is a member of the Mount Washington – Duquesne Heights Community Development Corporation, and the Board of Fellows of the University of Pittsburgh’s Institute of Politics. Lamb was also the founding co-chair of A Plus Schools, the community alliance for Pittsburgh Public education. Michael Lamb is an attorney admitted to practice in the Commonwealth of Pennsylvania. He received his Juris Doctorate from the Duquesne University School of Law, his Master’s Degree from Carnegie Mellon University’s H. John Heinz School of Public Policy and his Bachelor’s Degree from Penn State University. Lamb is also a graduate of the Local Government Academy. A lifelong resident of Allegheny County, Michael Lamb was raised in the Beechview neighborhood of Pittsburgh where he attended St. Catherine’s School. He then went on to South Hills Catholic and Seton LaSalle High School. Lamb resides in the Mount Washington neighborhood of Pittsburgh with his wife Jill.